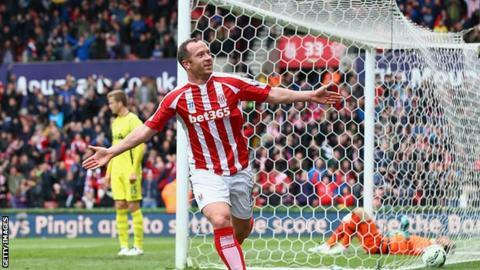 Tottenham's hopes of a top-five finish were dented as goals by Charlie Adam, Steven Nzonzi and Mame Biram Diouf earned Stoke a deserved victory. Midfielder Adam headed the Potters ahead after a mistake by Jan Vertonghen before Nzonzi's smart finish doubled the lead before half-time. Spurs, who had Vlad Chiricheș sent off, went closest when Stoke defender Marc Muniesa headed against his own bar. Diouf added the third following Marko Arnautovic's cross. Spurs are seeking a second top-five finish - and entry into the Europa League group stage - in three seasons. But Mauricio Pochettino's side look a shadow of the team that was challenging for a Champions League spot until recently. They have won one of the last six league games and could miss out on Europe all together unless they can arrest a poor run of form in the last two games. This was game number 55 for the season for Spurs and it showed as they produced a lacklustre performance that lacked the ingredients which earned victories over Chelsea and Arsenal earlier in the campaign. Stoke, better in every department, were ahead in the 22nd minute when Adam, one of the smallest players on the pitch, headed home after Vertonghen's attempted clearance let the midfielder in. Eleven minutes later it was 2-0, Nzonzi beating Hugo Lloris with a smart finish after the Spurs keeper and defender Eric Dier made a hash of a clearance. It went from bad to worse for Spurs as Chiricheș, booked in the first half for a foul on Jonathan Walters, became the seventh player to be sent off in seven league games between Stoke and Tottenham at the Britannia for hauling down Diouf in the 52nd minute. Stoke, who have equalled their club record Premier League points haul of 50, added a third four minutes from time as Diouf turned in a cross by the impressive Marko Arnautovic. Southampton's defeat at Leicester means Spurs stay sixth in the Premier League table, while Stoke move above West Ham into ninth. "I think it's up there with our best performances of the season. "I thought from start to finish that the level of performance was really high. The quality of play was excellent, certainly in the first half when we dominated what was, on paper, a really good Spurs side. "I don't think we allowed them to get a foothold in the game. They had the problem of going down to 10 men but in fairness that was probably their better period. Overall we were very comfortable in the game." "I think we were poor from the beginning. We are very disappointed for our supporters, our club and for us, because the way that we lost the game showed that we need to be stronger and ready to compete. "You could see in the first half that they were better than us and we gave them the opportunity to score. We were poor." Reaction to the game on the BBC Sport website. Relive minute-by-minute coverage from this game. Match ends, Stoke City 3, Tottenham Hotspur 0. Second Half ends, Stoke City 3, Tottenham Hotspur 0. Steven N'Zonzi (Stoke City) wins a free kick in the defensive half. Christian Eriksen (Tottenham Hotspur) wins a free kick in the defensive half. Attempt saved. Federico Fazio (Tottenham Hotspur) header from the centre of the box is saved in the bottom right corner. Assisted by Ryan Mason. Attempt missed. Marko Arnautovic (Stoke City) right footed shot from the centre of the box is close, but misses the top right corner. Assisted by Peter Odemwingie. Substitution, Stoke City. Steve Sidwell replaces Glenn Whelan. Attempt missed. Christian Eriksen (Tottenham Hotspur) left footed shot from the left side of the box is too high. Goal! Stoke City 3, Tottenham Hotspur 0. Mame Biram Diouf (Stoke City) right footed shot from the left side of the six yard box to the bottom left corner. Assisted by Marko Arnautovic with a cross. Corner, Tottenham Hotspur. Conceded by Ryan Shawcross. Mousa Dembélé (Tottenham Hotspur) wins a free kick on the right wing. Substitution, Stoke City. Peter Odemwingie replaces Jonathan Walters. Attempt missed. Christian Eriksen (Tottenham Hotspur) right footed shot from outside the box is close, but misses the top left corner from a direct free kick. Foul by Marc Muniesa (Stoke City). Attempt saved. Jonathan Walters (Stoke City) right footed shot from the centre of the box is saved in the centre of the goal. Assisted by Ryan Shawcross with a cross. Corner, Stoke City. Conceded by Nabil Bentaleb. Marko Arnautovic (Stoke City) wins a free kick on the left wing. Harry Kane (Tottenham Hotspur) wins a free kick on the right wing. Offside, Stoke City. Marc Muniesa tries a through ball, but Jonathan Walters is caught offside. Substitution, Tottenham Hotspur. Mousa Dembélé replaces Erik Lamela. Corner, Tottenham Hotspur. Conceded by Glenn Whelan. Hand ball by Christian Eriksen (Tottenham Hotspur). Foul by Jonathan Walters (Stoke City). Corner, Tottenham Hotspur. Conceded by Jack Butland. Attempt blocked. Harry Kane (Tottenham Hotspur) right footed shot from outside the box is blocked. Assisted by Erik Lamela. Federico Fazio (Tottenham Hotspur) wins a free kick in the defensive half.